I like rocky and sandy ocean bottoms. You can find me in North Atlantic waters from Canada to North Carolina. Clams, mussels, fish sea stars and other crustaceans. There’s much more to me than a fancy dinner entree! 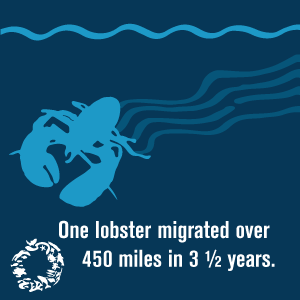 Known for our flashy claws and tasty meat, we lobsters make up a huge industry with millions of pounds harvested every year. 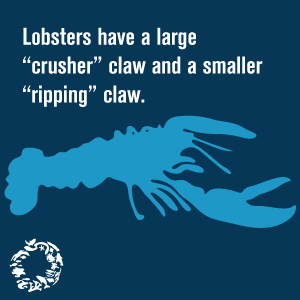 I’m in the crustacean subphylum, which also includes crabs, shrimp, crayfish and krill. I don’t have a spine, and instead rely on my tough outer shell for protection and stability. Once I get too big for my shell, I shed it and grow a new one in a process called molting. I have to be very careful in the months when I’m waiting for the new shell to grow, though, because I’m more susceptible to predators during that time. Gotta watch out for those other lobsters, too. We’re a pretty territorial bunch and will fight each other to establish dominance. We may be considered a high-class dinner now, but that wasn’t always the case. There used to be so many of us in northeastern U.S. waters that we were seen as “common” and only fit to feed to prisoners and the poor. There was even a law passed in the 18th century that forbade people from feeding us to their servants more than twice a week! I’m proud to say we have some of the more intriguing mating habits of the animal kingdom. A female will excrete a type of chemical called a pheromone to let us male lobsters know she’s ready to pick a suitor, typically the alpha male of the community. Then, she will enter the male’s den and participate in “lobster boxing” (yup, it’s exactly what it sounds like). Then, after the female molts, she’s ready to mate. She’ll stay in her mate’s cave until her shell grows back, then off she goes! Females will produce thousands of eggs at once and keep them tucked away under their tails for up to a year!